If you’re wondering how to protect your property from vandalism, you’re probably either worried about vandalism or a victim of it. To be clear, vandalism is the damage or defacement of private or public property without the express consent of the owner, and it counts as criminal damage. There are numerous acts of vandalism every day in the UK. The most common include breaking windows, lighting small fires, fly-tipping, and graffiti. Most of these are small-time and can be repaired quite easily with minimal stress. When your property is vandalised, however, it becomes a different matter. Want to know more about how we can protect your home or business? Talk to an expert. For most of us, our homes are the biggest investments we ever make in our lives. Whether you are a first-time homeowner or have recently inherited a large country estate, protecting this investment is important. So is feeling safe at home. If you are a business owner, you may also have commercial properties. Your business is your livelihood and business property is a serious asset. Protecting this from criminal damage and other illegal activity is sensible. There are several simple ways to reduce the likelihood of vandalism to your property. They don’t require much effort, they’re easy to implement, and they all start outdoors. Street lighting. Lighting puts off vandalism. Criminals don’t like to feel like they are being watched. If you have street lights in your neighbourhood, make sure they work. Contact your local council or authority if they break or stop working. Ideal for urban areas. Plant up your garden. Another option is to remove your property from the reach and attention of vandals by strategically planting bushes and other shrubs. Place these in locations where vandals might gain unauthorised access to your premises or use them to decorate walls, removing a surface to vandalise in the first place. Ideal for rural locations. Keep your driveway or premises clean and tidy. You might not value your rubbish but it could well catch the attention of a criminal as something to steal, break, or use to cause further damage. This is especially true of younger vandals acting out of boredom. Remove temptation by taking large objects to the skip and ensuring other waste and rubbish is bagged tightly. Keep outhouses, sheds, and stockrooms locked. This also goes for items like bikes and expensive gardening equipment. Anything stored outside of your property is more vulnerable to being damaged or stolen. Getting into the basic routine of securing these every evening will keep them safe, whether they are personal possessions or company assets. Stay vigilant. This extends beyond your property to the rest of the neighbourhood. Catching criminal activity on other properties can help you convict vandals, removing them as an immediate threat and reducing the risk of vandalism in the future. Neighbours will also appreciate this attitude, making them more likely to return the favour. This means an extra pair of friendly eyes on your home or business premises, even when you’re not there. The presence of cameras makes your property a much less appealing target. Vandals rarely want to get caught on camera, especially when footage can be used to ID them and convict them in court. Modern CCTV systems come in a huge range of models, from the basic to the sophisticated. You can even monitor some cameras remotely from your phone, giving you control of your security from your pocket. Learn exactly how CCTV improves the security of your property. Burglar alarms can be set up to trigger if the vandal goes to far as to attempt to break into your home. We recommend these for high-risk areas with a history of criminal activity or homes with especially valuable contents. Businesses should have them as standard. Fire alarms are also a legal requirement in most commercial buildings. If a vandal starts a fire, it could mean the difference between fire damage and a destroyed property. Make it as difficult for a vandal to cross your premises with an automated gate system. They can’t damage your property if they can’t reach it. Ideal for country estates and properties with large driveways. Gates can be designed to complement the look and feel of your property, providing discreet home security. You won’t need to worry about how to protect your property from vandalism if local vandals have been caught and charged. 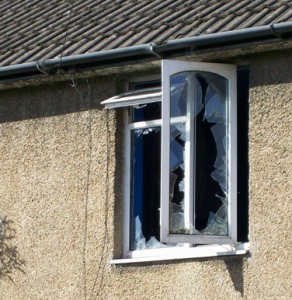 For this reason, if your property has been vandalised, you should always contact the police. The same applies if you catch somebody in an act of vandalism. If public property has been vandalised, the best point of contact is the local authority. Finally, if any form of public transport has been vandalised, contact the transport company. If the vandalism has taken place in London, the British Transport Police are your best bet. What are the penalties for vandalism? The three factors surrounding penalties and punishment for vandalism include the damage inflicted, costs of repair, and the amount of disruption caused. Smaller acts of vandalism make up the majority of these crimes and are dealt with in the Magistrates Court. The maximum penalty for vandalism that costs less than £5,000 to repair is three months imprisonment or a fine of £2,500. If damage is more than £5,000, the maximum punishment is six months imprisonment or a fine of £5,000. Given that most vandals are under 16, it is often necessary for alternatives to imprisonment or hefty fines to be meted out. 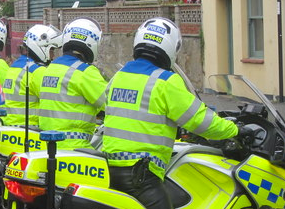 Police and local authorities have the discretion to issue on-the-spot fines of £50 for those under 16 and £80 for those aged 16 and over. While vandalism rates continue to drop, it’s safe to say that it will always be a part of our society. Stronger penalties for under 16s and the move from property vandalism toward cyber-based crime may go some way toward reducing vandalism rates but you can always do your bit by ensuring your home or business employs basic security measures. If you’re still wondering how to protect your property from vandalism, find out more about the different security measures you can use.